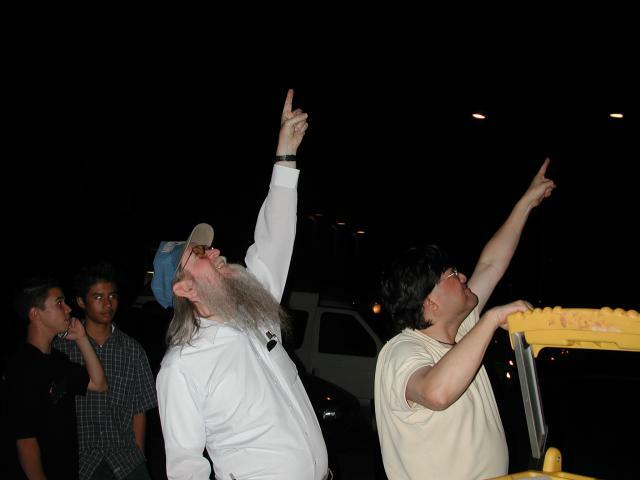 Tim Thompson and Dave Nakamoto point out some lunar domes. Photo courtesy of Morris Jones. The 12 day old waxing Moon brings sunrise to western Oceanus Procellarum, the ocean of storms. That means Aristarchus and Vallis Schroteri are near their visible best on this night, a night that Mojo and I set up our two sidewalk telescopes on a Monrovia corner sidewalk. We were soon joined by Mark and Lisa Rooney, fellow members of the Los Angeles Astronomical Society (LAAS) and the Sidewalk Astronomers who we met just the week before at a Griffith Park star party. Mark set up his Meade LX200 next to our two scopes. Soon we were joined by LAAS members Dave Nakamoto and Tim Thompson, who provided telescope nudging relief and astronomical interpretation to the nearly 200 visitors to our eyepieces over the next 2 hours. Mojo aimed at Jupiter. Mark aimed at Saturn, and I got dibs on the Moon. If you are a lunatic like me, the Vallis Schroteri region is an area of never ending awe. This part of Oceanus Procellarum is rich in volcanic structures. Selected as a landing site for the Apollo missions, it lost out to Hadley Rille as Apollo 15th's landing site. Among the many interesting features in this area is the bright young crater, Aristarchus. You've all seen a bright white crater north west of Copernicus. That's Aristarchus! It almost looks like someone put a dab of whiteout on a crater. Aristarchus is even visible on the night side of the moon during Earthshine! Telescopes of all sizes can pick out Vallis Schroteri, the largest sinuous valley on the moon. At the beginning of the snakelike valley is the cobra head feature, a 10 km widening just north of a tiny crater. The valley meanders in a "U" shape for 160 kilometers from the crater Herodotus to the south. At some points the valley narrows to only 500 meters wide. It terminates at a 1,000 meter high precipice on the edge of an uplifted tetragonal shaped continent called the Aristarchus Plateau. David Nakamoto commented that the plateau really did appear elevated with respect to the surrounding lunarscape when he took a look. That's the beauty of frequent lunar observing. You really see amazing details when the sun angle is just right, and hour by hour, the angle shows old favorite features in a new light, literally. Another unusual landscape that was starkly lit by sunrise was the Marius Hills. This area, like all the features I mention in this write up, looks best at sunrise (4 days after first quarter) or at sunset (4 days after last quarter). This is an area of 300 small steep-sided hills and domes. The best way for me to describe it in words is that it looked like shadows over a piece of pebbly laminate, like the ebony star or Wilsonart pebble sand laminate on the sides of my telescope. If I pretend a piece of laminate is the surface of moon near the terminator, and I shine a flashlight across it at a low angle, mimicking a rising sun over the laminate, the raised "bumps" look like the Marius Hills with shadows pointing away from the flashlight or away from the sunrise. That's what the Marius Hills looked like to me. Like hundreds of small bumps, each with a shadow facing the terminator. It was quite an amazing sight! There are many interesting studies of lunar domes. C. Weitz and J. Head of JPL studied the volcanic features of the Marius Hills complex using multispectral data from the Clementine UV- visible camera, and compared them to other lunar domes and cones. An abstract of their work is provided below, as are some images and observing notes. I hope this article encourages you to observe familiar areas of the moon and look for some of the amazing lunar domes. The Hitchhiker Guide to the Moon - click on the numbered sections for observing notes of the areas. These sections correspond to the Rukl Atlas of the Moon maps. Aristarchus Map 18, Marius Hills Map 29.